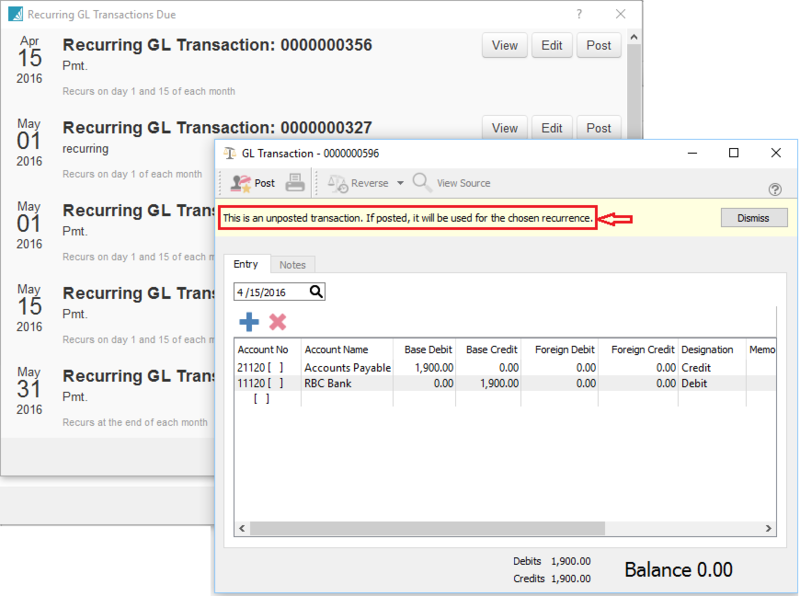 Recurring transactions allows past transactions to be duplicated on a schedule. Transactions available to recur are entries made directly in AP, AR or Journal Entries. The user can edit the recurring entry before posting it and then the next time the entry comes up on the schedule it will use the latest version of the posting. Save – Save the recurring entry. 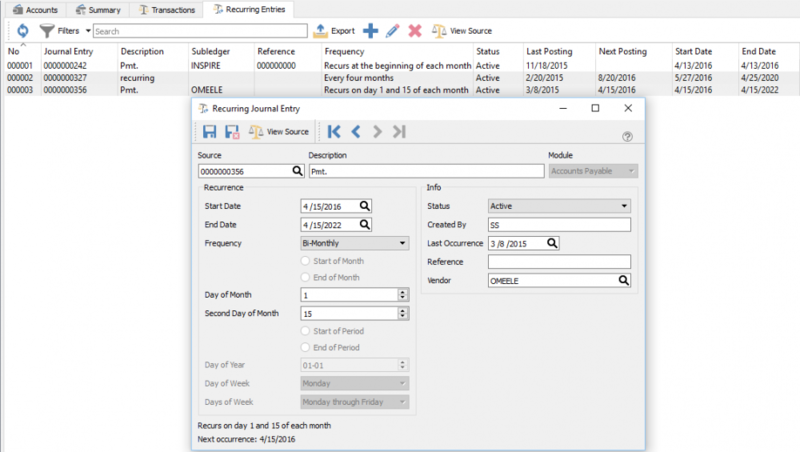 Save and Close – Save and close the recurring entry. View Source – View the GL posting of the transaction that was selected to recur..
Start Date – When the recurring transaction should start. End Date – When the recurring transaction should end. Start of Month – If the cycle selected is ‘Monthly’, select this if it should have at the start of the month. End of Month – If the cycle selected is ‘Monthly’, select this if it should have at the end of the month. Day of Month – If the cycle selected is ‘Specific Date’ then choose the day of the month. Second Day of Month – If the cycle selected is ‘Bi-Monthly’ then select the second day along with the ‘Day of Month’ above for the first day. Start of Period – If the cycle selected is’Fiscal’ then select the period. Day of Year – If the cycle selected is Annual then select the day of the year. Day of Week – If the cycle selected is ‘Weekly’ then select the day of the week. Created By – The initials of the user that created the recurring record. Last Occurrence – The last date the entry was posted. Reference – A reference can be added. Vendor/Customer – The vendor or customer that the entry will be posted to. If the user has the setting General Ledger/Alert Recurring Entries when the user logs in they will be presented with the list of recurring entries that are due or overdue to be posted. They can simply click on post, view or edit. *Note-The user can edit the recurring entry before posting it and then the next time the entry comes up on the schedule it will use the latest version of the posting.